Unknown to Yusuke the last enemy he has to face is the most demonic of them all. Hiei, the spiky-headed demon we saw earlier, learned about his other two comrades and planned on stealing the relics back from Yusuke and using it together with his sword of vengeance to conquer the demon world, so he decides to take a closer look on Yusuke. Meanwhile Yusuke enjoys his cutting class life when Botan arrives and explains about the third relic and the person holding it. Oh and Botan is dressed in the same uniform Keiko is in.. this makes things a bit complicated and then so Keiko runs out and sees this girl. Botan greets Keiko, but then Yusuke reminds her (with a smack to the head) that she doesn't belong to this world and might get things a bit tangled. Well Botan runs off, leaving Yusuke to deal with explaining to Keiko this weird things going on. Then from afar we see the surveying Hiei ready for his plan to take back the relics. Later as Keiko goes home still a bit dismayed about the girl (Botan) and Yusuke she meets Hiei who out of nowhere knocks her out cold. Yusuke then realizes from his detector that a demon is close by and he goes to follow, as Botan appears and tells him that the last enemy he is going to face has Keiko as hostage. This angers a furious Yusuke even more, and as they arrive at the place (an old abandoned warehouse, a typical battle sight...) they are greeted by people with some weird red something in their forehead. Hiei then appears telling them that he controls this people with his jagan (third eye) and he presents Keiko, still out cold. Then Hiei demands the relics in exchange for her, which Yusuke obliges to offer. Just then Hiei double crosses Yusuke, saying he controls Keiko's life, and then we see a red demonic eye suddenly forming over Keiko's forehead. Botan tries to stop the awakening of this eye with his spiritual power, as Yusuke prepares himself to fight Hiei. Hiei explains that the antidote for the eye is in the sword he is carrying, and he dares Yusuke to try and get it if he can. Out of the blue Yusuke flies high and smashes Hiei right in the jaw, and an unexpecting Hiei falls down. Now enraged, Hiei uses his hyperspeed to daze Yusuke, but Yusuke follows Hiei's movements and lands another right hand on Hiei's jaw as he tries to attack. Now furious than ever, Hiei transforms himself into his demonic form, as red demonic eyes began to pop out of his body and his complexion turns green. This somehow shocks Yusuke, and then Hiei gets the upper hand when he traps Yusuke in some kind of spiritual bonds. Now Hiei beats up Yusuke, and then as he was about to land the finishing blow with his sword, out of nowhere someone attacks Hiei's third eye, blinding him for the moment. It turns out to be Kurama, who was just paying back the debts he owe to Yusuke when he saved his mother. 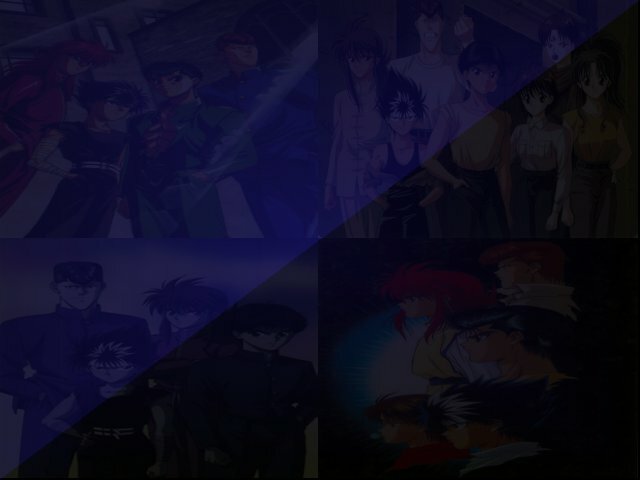 Kurama absorbs Hiei's sword attack in the process, but gives enough time for Yusuke to recover and release the bonds binding him. Now stronger than before, Yusuke matches up with Hiei, landing every attack as getting hit by his opponent the same time. Then Yusuke thinks he won't win this way, and he runs away from Hiei. As Hiei follows Yusuke turns back and unleashes his rei gun on a surprised opponent... but however Hiei's hyperspeed made him evade the blast, and Yusuke loses his strength upon releasing the attack. Seeing he has finally won the battle, Hiei gets too overconfident when suddenly the rei gun returns to him and nails him behind, knocking him unconscious. It turned out that the mirror of reality was there behind Hiei and the rei gun attack reflected on it and nailed an unsuspecting Hiei. Now Yusuke wins the battle, gives the antidote to Keiko, and recovers the sword and his mission is finally complete. As Yusuke goes back to his daily cutting class lifestyle, Botan approaches him and tells him that the relics went back to the spirit world in time for the arrival of King Enma.. however since the ball was soiled, the mirror shattered, and the sword rusted, Enma discovers the real thing behind, but since the relics were recovered he decides to only give a minor punishment to Koenma... a good ol' spanking ^_^ as Keiko suddenly appears giving Yusuke the scare of his life (we believe that making an explanation when your girlfriend sees you with another girl is a harder mission than recovering the stolen relics) as the episode ends.